These days of tablets, laptops and bro=ong-a-browser thee are a lot less computer labs, and technology is a lot more ubiquitous, but some schools still find labs useful - however, it is fair to say that I am generally opposed to the layout where groups of children or other learners sit at computers facing the wall in a familiar, but horrid, way. Sitting facing the wall was formerly a punishment and just adding a bit of technology doesn't change the social isolation and exclusion much. Asking schools why they seek to "punish" children in this way the answer is usually that a wiring technician decreed that trailing cables were a hazard and thus the "punishment regime" was implemented. Oh dear. Of course imaginative schools use neat ideas like enclosing all the cables in bright coloured flexible, visible, cheap, piping to allow much more creative layouts and I commend this to you. One immediate improvement in "labs" is to mirror the walls behind the computers so that at least teachers and students have eye contact - this makes an enormpus difference to the teachers - who sees both face and screen, rather than back-of-the-head and screen, and immediately the room becomes more "sociable" and less "punishment regime". IKEA do a very handy cheap mirror (KRABB) which, glue-gunned horizontally, can creat a not unattractive mirrored frieze around this kind of wall facing lab. But what alternative '"edge" layouts? 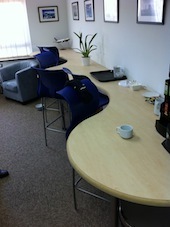 Going beyond the obvious we looked at the behaviour of children in different "sweeps" of desk edge layouts. In the illustration below the three learners on an inside sweep of the desk edge (on the left in the sketch above)would be fiercely collaborative but in a quite intimate focussed way. They would lean forward, focus on their screen and their screen alone and become completely lost in the task (if it was a good one). Even screens nearby with useful cues and clues would escape their attention. Clearly there are many circumstances where this level of intimate, collaborative concentration is desirable. Equally though, those located at an outside sweep of a curved desk edge tend to be differently collaborative: they are much more likely to be part of the whole group efforts, eyes will be often glancing around the room and they will be aware of others' efforts. They tend (if allowed!) to rock back on their chair's rear legs and they exhibit a more gregarious learning. The issue here is of flexibility. Obviously laptops or tablets allow an easy move from one part of the desk to another, but small, lighter desktop computers have previously allowed this too. Dedicated computer room furniture is a nightmare to order; specialist desks are ridiculously expensive but the "let's screw lengths of worktop to these old desk legs" approach just takes you back to punishment "facing the wall" layout. But just cutting out "bites" from those worktops and adding them back on as "bumps" is cheap and easy and works rather well. By the way, these convex / concave edges work really well on central "piers" and "islands" as well. Again creative schools try all sorts of layouts and sit back to judge what works in their context with their learners, then note what improves... this is iterative action research. Thinking of the learning space as a "stage" for different "Acts" and "Scenes" of learning helps to get that "agile" and reflective mindset in place. Another "little difference" with a "big impact" is wall and vertical surface displays of student work in ICT or technology rich spaces and indeed everywhere. 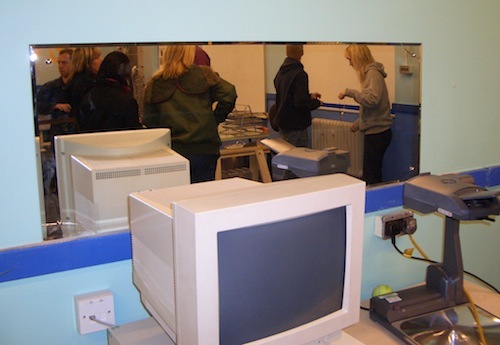 Surveying a number of school "tech" rooms in 2005 it became clear that something approaching three quarters of all the notices and display material that was sourced from within the schools (ie not posters from computer companies!) were to tell students what they could not do: "no eating, drinking in this room", "please don't xxxx". This is negative enough to stop the most enthusiastic learner dead in their tracks, but a further problem concerns the display of children's work which is typically the product of considerable work by the student/s, but is usually displayed without the drafts that led to that output. If you keep drafts, digital or paper, it is so easy to then show process, and to develop in children a sense of "ipsative referencing", of feeling and evidencing their own progress through a portfolio of subsequent and consequent drafts, printed or just as saved files. 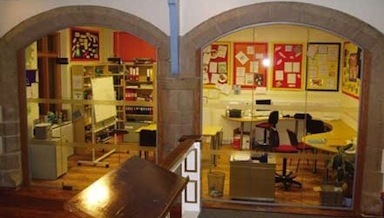 The impact of wall displays that offer some narrative ("here's where I started, here it went a bit wrong, this is the finished coursework..") is dramatic because younger, or other, learners are challenged by that process narrative and begin to form an understanding of what the key steps are in a piece of work. 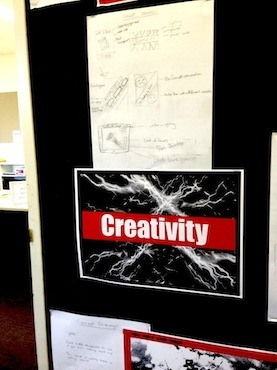 As I was looking at this process-and-product wall display (above) in Mark Oliphant College, the girl who created the work came over to explain that she had learned much since it was put up and she now knew how to do the background image without the pixelation that was evident. She said: "I've learned so much since then!". Fab! In time this will be an assessment requirement anyway, so getting the habit of narrating process through wall display is no bad thing! But do please remember to date stamp everything that goes up - relative currency matters in role models. Finally, we all know that a simple of model of learning includes the impact of a sense of audience (as indeed with the wall displays above). One very easy way to attain that audience is to beam and focus a projector onto a large external window at night (every night, at least in winter...) and to use that "screen" to show moments from the learning day. 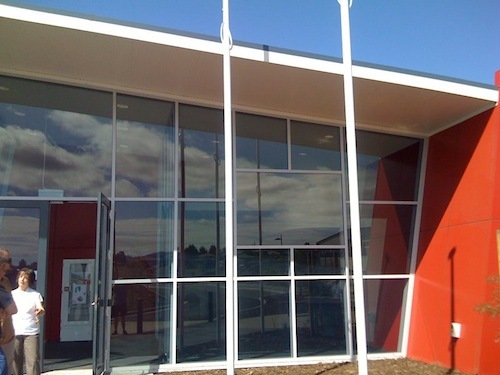 In this school above (St Aloysius in Tasmania) above you can see the main "reception" window even has a frame in it for the projector to be focussed into, and passive shading above it. Giving a student the chance, weekly, to collect "great moments" from the learning week is easy, but hugely motivating and at night the screen looks like a million dollars!. Try it!